After 30 years of our family raising market sheep, this past April we had a first… our ewes and lambs were attacked by dogs. We have had many close calls with coyotes and stray dogs, but never an actual attack. A family friend witnessed the attack and contacted my husband. After receiving the call and knowing my husband would arrive at the scene before I would, I began to worry about his comment, “looks like we will be adding a couple of dogs to our compost pile”. I did not know our legal rights to protect our livestock and in this day in age with people filing lawsuits for some of the craziest things I was worried my husband’s actions would get us in trouble in the end. So what rights do we have to protect our livestock? The following are statements taken from the Ohio Revised Code that will better explain our rights to protect our livestock. To view the Ohio Revised Code Section 955: Dogs, in its entirety go to http://codes.ohio.gov/orc/955. What are you rights if you are witnessing an attack in progress? Who is liable for damages in a dog attack? Under 955.28 (B), “the owner, keeper, or harborer of a dog is liable in damages for any injury, death, or loss to person or property that is caused by the dog”. What if the dog is not seen or captured? What if the dog owner is known? What if a dog attacks a registered flock? How is the payment of claims determined and processed? What if the attack was determined to be made by coyotes? For claims for value of animals injured or killed by coyote see 955.51 to 955.53 of the Revised Code. So what happened in our dog attack experience? My husband did beat me home that day, but the two dogs were gone. My husband called the veterinarian and I called the sheriff’s office who directed me to the animal shelter to page the dog warden. Our family friend who witnessed the attack did take a picture of the dogs with his cell phone and once the necessary calls were made, a little search party found the dogs two blocks down the road and they were captured and brought back to our place to await the dog warden’s arrival. We had one ewe lamb badly injured and deiced to put her down. Skin from one of our show lambs’ had been torn badly down both sides and required sutures. After about seven days of antibiotics and pain medicines to fight the fever, infection, and inflammation, the lamb has made almost a full recovery minus the scars and weight loss. Between the dog warden and our insurance company, the investigation and paperwork was completely taken care of and almost six weeks after the attack the owner of the dogs gave us a check for the loss of the ewe lamb and vet. 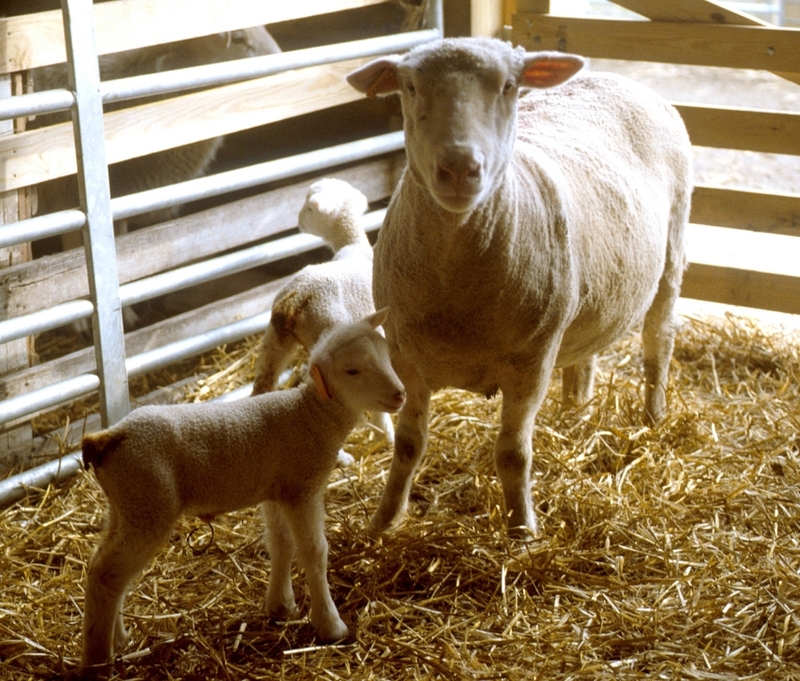 costs and treatment for the four other lambs that were injured. As a result, we purchased a Great Pyrenees puppy two weeks after the incident and even though she is only six months old she has a done a great job of letting us know when someone or something is near the sheep. Below are other ways to protect your flock taken from the Helping Producers Manage Predation Guide Issued October 2002 by USDA Wildlife Services. In increasing numbers, livestock producers are using guard animals in their pastures and on open ranges to prevent predator attacks. Guard animals include dogs, donkeys, llamas, and mules. Dogs are by far the most popular of the protective animals, although llamas, which guard by intimidation, are also gaining favor with producers. The most effective guard dogs are Eurasian breeds, such as the Akbash and Great Pyrenees. A good livestock guarding dog stays with the animals without harming them and aggressively repels predators. A guard dog is not a herding dog but rather a full-time member of the flock that has bonded with the animals in the herd, usually sheep. Guard dogs don’t solve the problem, however; they just prevent isolated attacks. In their efforts to protect livestock, guard dogs are also vulnerable to attack themselves. The number of dogs needed to protect a flock depends on its size, the local terrain, and the livestock species onsite. Excluding dogs/coyotes by putting up fencing, especially in large areas, is expensive but can offer some protection. Many dogs/coyotes, however, learn to dig deeper or climb higher to defeat a fence. To be effective, the fence should be about 5.5 feet high to keep the predators from jumping over, and a buried wire apron or barbed wire at ground level can discourage digging. Producers can also install electric fencing to keep predators from climbing over. Livestock managers should carefully consider a variety of factors, such as the type of terrain and size of the pasture, before deciding whether to build a fence. Fencing is most likely to be cost effective when the potential for predation is high and fencing can be incorporated with other means of predator management. For example, guard dogs and fencing used together achieve a higher rate of success than either alone. Effective fencing, however, can impede the movements of other wildlife and should be installed only after a professional wildlife assessment. Loud noises, lights, and repellants can also be helpful in scaring off predators. Cougars, wolves, coyotes, and other animals are easily frightened by strange odors, sights, and sounds. Using these methods in combination can work even better. For example, producers can use propane cannons, sirens, and radios with sound amplifiers to scare away predators lurking around pastures or open rangelands. While these measures can be effective, their benefits are often short lived because predators can adapt to new repellants and devices quite rapidly. Posted by Braden Campbell at 12:10pm August 17, 2017 Posted in Predators and tagged Predators. Bookmark the permalink.